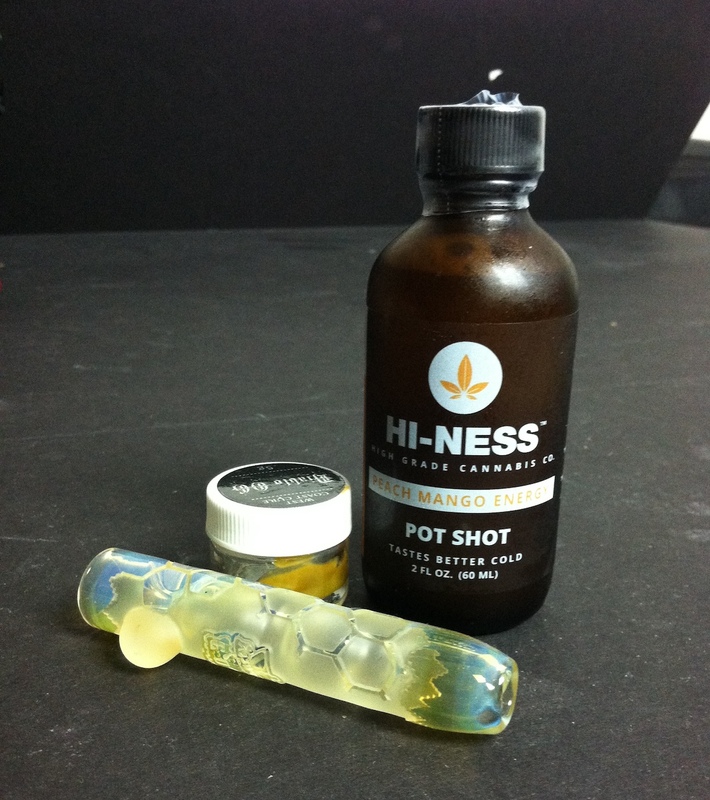 The Hi-ness Sativa Pot Shot is a 15mg, 30mg, and 60mg cannabis infused tincture. The tincture’s basically made with fruit juices, sugar, some tea (now being removed from newer products), cannabis oil, and couple preservatives. It’s a quick dose, contained in a small 2 oz opaque bottle. You can easily gulp it down in a couple chugs or meter out to a smaller amount. The sativa tincture is made specifically with peach and mango, giving it a bright fruity flavor to mask the cannabis. A 60mg Hi-ness Pot Shot will run you $10-15 depending on the dispensary. I got to try the 15mg and 60mg sativa Pot Shots by Hi-ness. You can see me drink the 60mg on YouTube. The tincture tasted great. The peach and mango flavors do an excellent job of masking the cannabis oil. Although the cannabis oil taste will sit on your tongue unless you have something to cleanse your palette, so it becomes pretty apparent afterwards the initial fruity blast. The cannabis oil itself is good quality, you can tell by the taste it’s a CO2 derived oil, not the taste of herbs or green. After the taste on my tongue, I got a tingling sensation and an immediate reaction to the cannabis. Since the cannabis oil is suspended in such a simple mixture, it gets absorbed fairly easily by the copious membranes present in the tongue. So a drop on your tongue is already absorbing some of the THC into your bloodstream, rather than waiting for a brownie to blast you in 20 minutes. It’s fairly effective, and it makes it a very approachable edible, as it gives you some instant satisfaction along with an elongated stone. The high itself was very a very clean and clear sativa. Definitely something that wouldn’t inhibit your mental capacity to work, if you needed to get high before the job. You get a little bit of energy at the beginning, and you receive the a bigger wave of energy sustained through a 4-5 hour period. As a heavy toker, and someone who eats 150-300mg edibles to get me started, I thought this hit me fairly hard for the dose (60mg) — but not hard enough. The 15mg didn’t really “hit” me at all, but I did get some energy out of it (taking me from a sleepy state to more awake, but not energized). I’d almost prefer a sativa strain with greater mental stimulation and creativity, like the kind of high I receive from a good Jack Herer or Tangie. I haven’t had the opportunity, but I’d love to drink 2 or 3 of the 60mg and see if I can achieve the effect I’m really looking for. I drink one in the morning as an alternative to coffee, and it gets me more awake, but not the same energized buzz that caffeine (or a fat bong hit of sativa) has. I also mix it into my green smoothies and it’s the perfect way to infuse them, the fruity flavors go great with other real fruits and veggies. 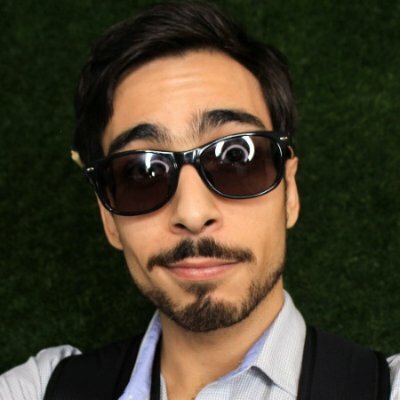 Overall my experience with the Pot Shots by Hi-ness was pretty positive. It’s a great edible alternative to things like cookies and brownies, that may not be the best treat anytime of the day. I’d highly recommend these over things like 5 hour energy, I’d rather someone tank 10 of these in a day than getting cranked on Red Bull. The fruity taste was great and the high was uplifting. The only downsides were the heavy weed taste that stuck to the tongue after, and I needed a higher dose for more energy. I’d give the Hi-ness Sativa Pot Shot a 7/10, solid drink to get you stoned quick once you wash the weed taste down.